Earlier this week, my latest column came out in the April issue of the BGCM E-Message, the free monthly email newsletter of the Baptist General Convention of Missouri. The piece is entitled "Quite Different" and is a reflection on the recent BGCM annual meeting. In it I argue that it was quite different than the average Baptist meeting because it was pleasant, inclusive, and missional. 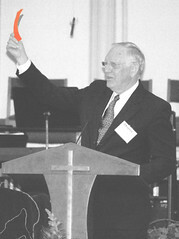 This photo, which ran with my column, is BGCM President Harlan Spurgeon leading the messengers during a time of voting. One of the very first items on the agenda was a vote that allowed more people to become messengers and participate (which is exactly the opposite of what some Baptist groups have been doing lately). To watch the annual meeting online, click here. To see more photos from the weekend, click here.